Former England captain Chris Robshaw says he is ready to begin a "new chapter" in his international career. 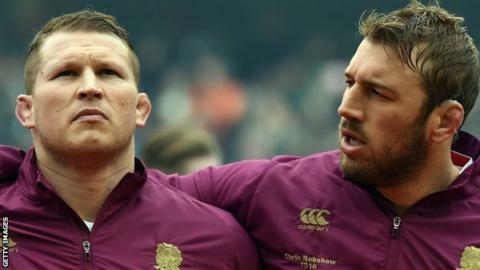 Robshaw lost the captaincy to Dylan Hartley after last year's disappointing performance at the World Cup. But new coach Eddie Jones has challenged the 29-year-old to come away from this year's Six Nations as Europe's leading blindside flanker. "Hopefully I'll have the opportunity to go out there and right some wrongs," Robshaw said. "Hopefully I can perform and repay that trust in me that Eddie has shown so far. "It was difficult coming back from the World Cup, but I need to go out there and hopefully achieve again. "We all have setbacks in sport and in life and a lot of people in our game have gone on after them to be extremely successful." The Harlequins player refuses to be downcast about losing the role he first took on in 2012 and is keen to play his part as England chase a first Six Nations title since 2011, starting on Saturday against Scotland at Murrayfield. "I fully understand the reasons for the captaincy change and respect Eddie for his choice and will support Dylan as well as possible," he added. "Eddie is a good guy and he was honest with me and I think that is what you want from a head coach. "For me now, it is about being part of the team, doing my bit for the team whatever that may be and supporting Dylan."